Like a true road runner, I’ve committed the situational awareness faux pas of looking at my feet, and missed one of the well marked turns in the 2015 Channel Ridge 9k produced by the Salt Spring Island Trailrunners. I run back to the corner and wonder how I missed the flagging indicating the turn in advance, the one indicating the corner, and the one marking the trail beyond. Returning to the route proper, I’m feeling too ashamed around the next corner another round of distractingly fine scenery is revealed. The run is advertised as nine kilometres, but for me now has a little more; Salt Spring Island believes in added value it seems. The course is a rolling romp through only moderately technical trails, with a couple slippery patches. That could have been entirely different though, but the weather has cooperated this morning. The sun has come out in time for the race at the semi-Mediterainian microclimate end of the Salt Spring, drying the course from the previous nights rains. Overall the course is dry, with only a few spots in open meadows, where I’m picking my way across mud and angled flat rock like a great dane on a marbled floor. This is a grass roots endeavour, put together by a handful of local organizers and conducted with a suitably laid-back island vibe. In true island style race marshal Dave Melanson of Project Talaria, kicks the event off with a safety meeting down by the prayer-flag starting line. Out on the run the 9 kilometre lollipop course is rollingly aggressive in an elevation profile with enough elevation gain and loss to hold a trail runners interests all without sliding into mountain running territory. There’s a good diversity of scenery as the loop works its way from small pastoral hillside meadows skirted by poplar trees, into more traditional British Columbian pine forests, then into lush near rain-forrest groves. The last of which offer a steep “what the heck just walk” climb. For the competitive, have no worries, there are fast runners in attendance and they are ready to issue the challenge. For the rest of us though Channel Ridge offers has an affable grass roots nature with all participants get a high-five as they cross the finish-line. The post-race continues to be an intimate affair. Dave’s mom is slicing bananas, I chat with co-organizer Peter Oro about the upcoming events and the course. Then there’s the prize raffle, featuring a near one-to-one ratio of prizes donated by sponsors to race entrants. That friendly outlook is a huge part of what makes the Salt Spring Island Trailrunners’ series a great destination run — especially after the overwhelming masses of the Vancouver Marathon or Sun Run. These are still small races, and with approximately 30 participants for the Channel Ridge 9km there’s far more camaraderie and community mixed with the festivities than in the established mass-races. This race series also represent a chance to see portions of Salt Spring Island most visitors, and likely a majority of islanders, never get to. 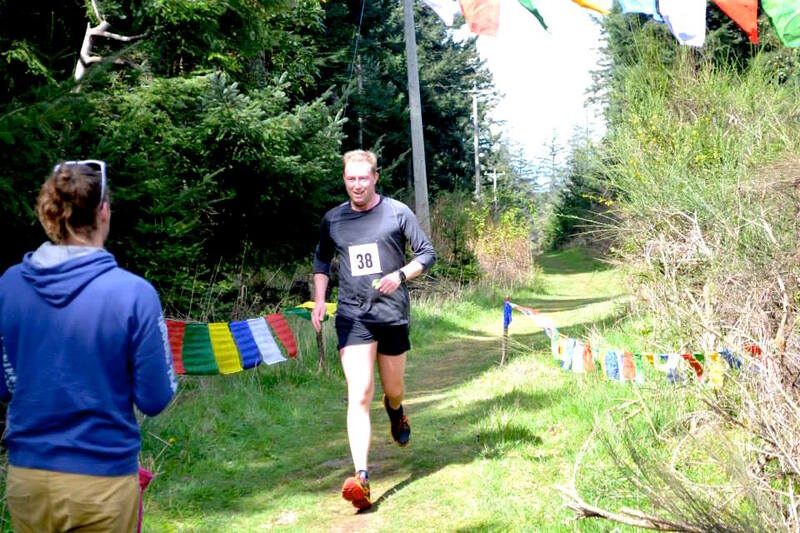 The next race is the Salt Spring Island Trailrunners Series is the Ruckle Park 11k on May 30th, 2015. According to the organizers, this a moderately more technical run featuring approximately the same 120m climb in elevation overall, but the opportunity to traverse some of the most pristine coastline the island has to offer. For non-competitive types, like myself, that means the take the time to be distracted by the views and snap a few pictures as much enjoying the run itself.